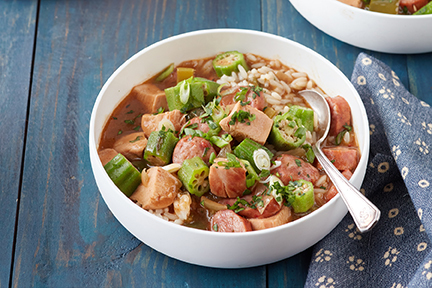 Dale’s Chicken Sausage Gumbo is great if for a hearty dinner. This recipe is so flavorful because it calls for chicken, sausage and Dale’s Seasoning with your choice of white rice. Looking for a similar hearty dish check out Dale’s Beef Pot Pie. Frist, place chicken thighs in a large plastic container or gallon sized zip top plastic bag. Next, add ¼ cup Dale’s Low-Sodium Seasoning. Discard seasoning and place chicken on a paper towel lined plate. Pat to dry. Then, heat a large dutch oven or heavy-bottomed pot over medium heat. Then, sausage starts to brown, about 5 minutes. Reserve sausage on a plate and set aside. Return the dutch oven to medium heat. Place the chicken in a single layer and cook, 8 minutes total, turning pieces once when they no longer stick to the bottom of the pan. Remove to a plate and let rest until cool enough to handle. Return the dutch oven to medium-low heat. Add the 2/3 cup of vegetable oil, then flour while stirring constantly. Reduce heat to medium-low and cook, stirring frequently, until the roux is medium- brown/caramel color, about 18-20 minutes. Add onions, peppers, and celery to the roux. Finally, cook until slightly softened, about 6 minutes, stirring frequently.